Saturn transit from Scorpio to Sagittarius on 26th January 2017. Saturn leaves your 11th house and will be in the 12th house till next transit (till 24th January 2020). From the 12th house, Saturn aspects your 2nd, 6th, and 9th house. Planet Saturn, who had occupied your 11th House will now transit to your 12th House, the position of expenses. 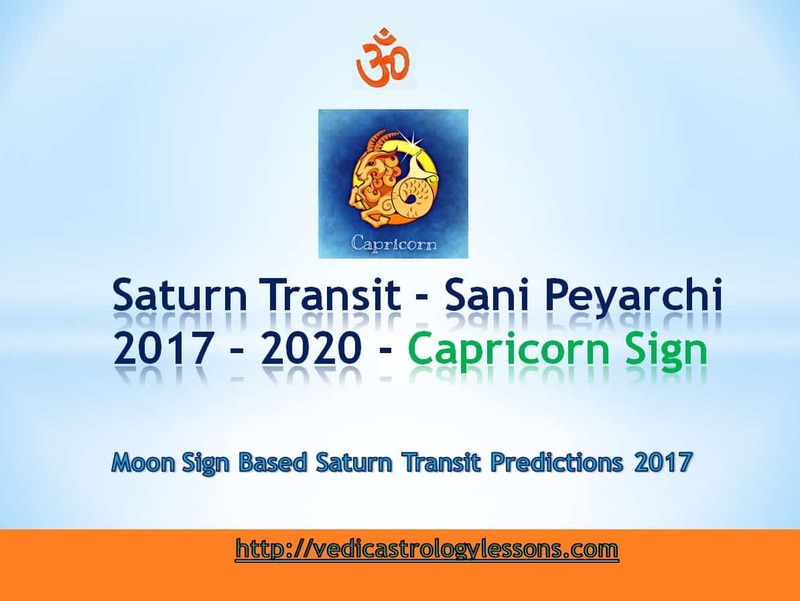 Saturn Transit 2017 effects on Capricorn: The 12th House is not only the House of expenses but also the House of investment. Planet Saturn is the Ruler of your Birth Sign, Capricorn. He is the ruler of your 2nd House which deals with family. Due to His presence in your 12th House, you might have to travel a lot. Some might face changes in your location, House, job or office. For some, their delayed tours to foreign places will now take place. As you have to travel a lot, you will be tired and sore most of the time. However big your income is, you will see that the money never stays in your hands. It will either get invested or disbursed. So it is wise to curb in unnecessary expenditures. You might face some trouble due to your hidden/ unknown enemies. Though your income will be quite good, you will face some scarcity of money. Be vigilant in your monetary transactions. After the Saturn Transit, even though your ventures might face delays and obstacles, you will get good results from them. Your new schemes will be moderately successful. Your younger siblings will be helpful to you. Joyous occasions like marriage and new jobs for your siblings will bring you happiness. Generally, you can see festive celebrations in your family. Though you might have to struggle to welcome new members to your family, your family will be delighted. Chances of buying new properties, lands, and vehicles are in your cards now; otherwise, you might have to spend on household/ vehicle repairs. Employment opportunities will arise for the jobless. Some might receive a pay rise and promotions after Saturn transit (Sani Peyarchi). Show concern for your mother’s health. Your romantic life will be pleasant. Your father will be kind and supportive of you. You will get a new circle of friends. You might have to let your house for rent or lease. You might face lots of trouble and upheaval in receiving your ancestral properties. Rumors that malign your name will do rounds in your society. Do not indulge in unnecessary gossip. Keep your words to yourself. You must maintain a patient and composed nature at all times. You might have to face unwanted competition and resentment in your job. Your co-workers might cause some problems for you. Those who were supportive earlier will be hostile towards you. Be always vigilant while traveling or driving. Take extra caution when buying new properties and animals. Your problems with visa and passport will vanish and you will get them easily enough. This Saturn transit will bring mixed fortunes in your business. You will face difficulty in laying your hand on your hard-won business profits. Though your income will increase, your expenses will increase manifold. But, with the blessings of God, you will overcome all your difficulties. You will get new partners in your business. Take good care of your health. Try to change your lifestyle to a healthy one. You might face issues with keeping your promises and finishing your tasks. Keep aside any confusion, doubts, and mistrust and focus only on succeeding in your endeavors. Based on your current Dasa and Bhukti(Subperiod) the effect of this Saturn transit for Capricorn sign will change.